One of my good friends has what appear to be the whitest teeth ever (and no, they’re not veneers). One day we were out playing golf, and I said to him, “Tom, how are your teeth so white? 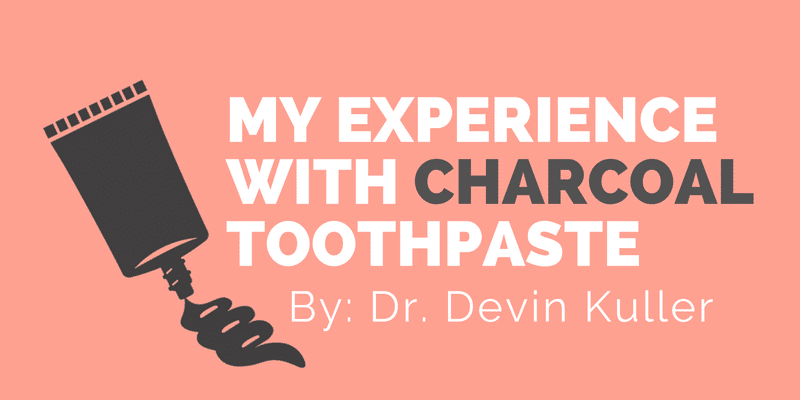 What do you do?” He replied, “I use charcoal toothpaste, and that’s it.” So, I decided to do my own personal research and try this stuff out. It’s all over social media, and a lot of people have been asking me about it. The claim is that the activated charcoal is a detoxifier that will remove toxins, stains, and plaque naturally by binding with them. I bought a very popular charcoal toothpaste from Amazon and used it for a while to see if my teeth would get whiter. After a month of regular use, I did not notice a marked difference in the color of my teeth. I should also add that I did not find coconut flavored toothpaste the color of coal to be all that refreshing. Some people may like this flavor/color profile, but it turns out it’s not for me if I’m going to see little, if any, change in the shade of my teeth. As far as the science behind charcoal toothpaste products is concerned, The American Dental Association concluded that there is inconclusive evidence to substantiate the claims made by users and producers of these products. There’s just not enough research to reassure us that they are a safe and effective way to whiten teeth or prevent dental disease (i.e., gum disease and cavities). While they may work for some individuals, more studies and clinical trials need to take place before any effects, good or bad, can be proven. So, what does that mean for you if you’re thinking about trying these activated charcoal dental products? Even though I used the toothpaste daily, I would suggest using it less frequently and brushing gently if you’re conducting your own experiment. Depending on the formulation of the toothpaste, it can be very abrasive. If an abrasive toothpaste is used too frequently or over an extended period of time, you run the risk of actually eroding away top layers of your enamel with all that grit. If you’re cavity-prone, consider brushing with an ADA approved toothpaste in conjunction with these products, so you still get the cavity-fighting benefits of fluoride. The reason I took the chance for a month is that I’m not very cavity-prone and I drink tap water regularly, which is a good source of fluoride in NYC. Just because you saw one charcoal toothpaste success story doesn’t mean using it is always going to be effective or even safe. On that note, there is one last bit of entirely subjective information I would like to add. My buddy Tom, while he may have incredibly white teeth, has had a number of fillings and root canals done while using this toothpaste. My advice is to proceed with caution or avoid altogether.